A large flock of Sandhill Cranes were seen circling the farm this weekend. 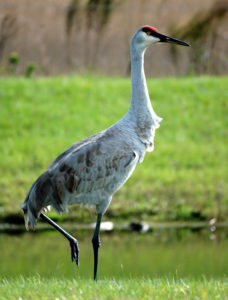 The sight and sounds of Cranes are always a sure sign of spring but this is a little earlier than normal. We hope to have more visiting the farm this year. Last year we had a pair checking out the wetlands in the fall. We are still amazed at their remarkable turnaround from being an endangered species. 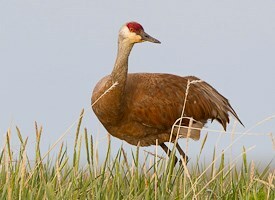 Sandhill Cranes give out unusual loud rattling bugle calls, each lasting a couple of seconds and often strung together. They can be heard up to 2.5 miles away and are given on the ground as well as in flight. They are very distinctive from the Canada Geese we frequently see and hear. The Sandhill Crane has recovered significantly in the last 30-40 years and now are fairly common though local to northern Illinois. They have expanded their territory into the Midwest prairie areas and are starting to nest further south. In some areas during migration they congregate in the hundreds of thousands. They are large birds, often over four feet tall.